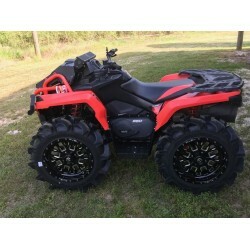 ATV Parts, ATV Radiator Kits, ATV Wheels Tires, ATV Suspension Springs Shocks Bumpers - Wild Boar ATV Parts > Floorboards > Can-am Outlander 500/ 570/ 650/ 800/ 850/ 1000 Gen2 Floorboards $360.00 FREE SHIPPING! Want to run bigger tires without modifying your bike to much? Wild Boar ATV has you covered! Check out our latest product for the Can-Am Outlander! LAUNCH PRICE OF $360.00 INCLUDES SHIPPING! Radiator Relocation Kits, Audio Systems, LED Lighting, Accessories, Cleaners & Oil Change Kits, BELTS, AXLES, Lift Kits, Snorkel Kits, WINCHES, Wheel Spacers, Tires & Wheels, BIG WHEEL KITS! without completely modifying your machine or spending a fortune. Our new metal floorboards allows you to run a 32″ tire with your stock suspension. These floorboards are powder coated flat black for durable, yet sleek look. Foot pegs and hardware are included, no need to cut your stock pegs.